Emaillerie Belge may be the most famous Belgian beer brand you’ve never heard of. They don’t brew or blend, and you won’t find their beer labels on the shelves of your local bottleshop. But, if you’ve ever sat in a bar run by people that appreciate Belgian beer, then you’ve probably seen the company’s work hanging on the walls around you. Emaillerie Belge is the last enamel advert producer in the Low Countries, and it has been making ad panels for Belgian breweries for almost a century. The company survived a tumultuous 20th century and several flirtations with bankruptcy. 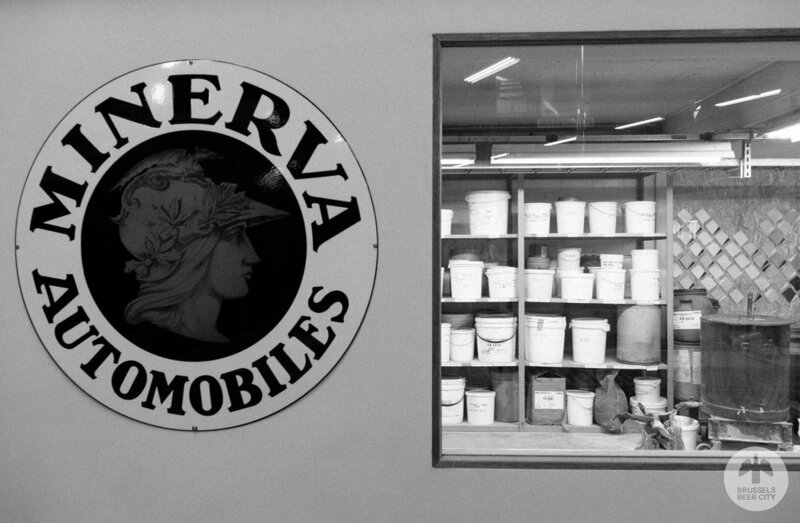 Now under new management, it’s working to recapture the glory days of the enamel ad industry, betting that its small scale, custom, and high quality output can succeed against low-cost, industrial enamel producers. The histories of Emaillerie Belge and of Brussels brewing are closely intertwined, and abeer remains central to the company’s latest revival. “I had a wow effect.” Vincent Vanden Borre is trying to explain how a visit to Emaillerie Belge’s factory led a 26-year-old Flemish business graduate running a failing enamel factory. “I was just so impressed with the artisanal skill, the authenticity, the niche of the product, the quality of the finishing,” he says. Two years in to his leadership and he’s still trying to replicate this first impression for visiting clients. The factory has relocated in the meantime to an old clothes warehouse across the road from a groundscraper Audi factory in Brussels’ Vorst district, but Vanden Borre took most of the old equipment with him. It is all housed underneath one vaulted wooden roof – the furnace and packaging equipment on the main work floor, with various ateliers spun off in smaller side rooms. 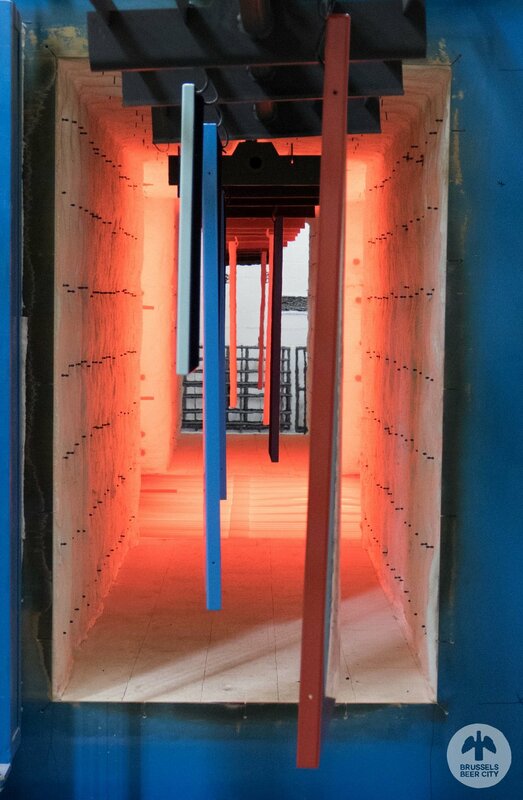 As Vanden Borre points out the various stages of production – screen-printing, enamel mixing, paint spraying – and where they take place, a whoosh of hot air blasts us in the face. Blue-aproned workmen are cranking open the furnace, preparing to guide unfinished panels on a lemon-yellow conveyor into the searing pink heat of the factory’s furnace. Vanden Borre’s subdued patter and the jangle of the panels on their hooks aside, the factory is quiet. Opposite the furnace, the entire surface of a two-storey wall is given over to ad panels from Emaillerie Belge’s past. There are so many that, even stepping back, it’s hard to take them all in at once. This jumble of rectangles, squares and circles chart a visual history of Belgium’s post-war drinking habits. Palm, Stella Artois, Hoegaarden, BelleVue, Vedett. But also Spa Citron, Coca Cola and Sandeman’s Port. In among all of these is a limited edition gold-embossed Chimay panel, with a flashy gold-embossed finish that beams under the factory’s fluorescent lights, made for the launch of Chimay Grand Rèserve in 2014. Beer advertising has been central to the Emaillerie Belge’s output almost from its beginning, and the company still has a legacy of return customers – “Stella, we have Vedett, Duvel, Omer, La Trappe – we have so many!” Vanden Borre says. Since his takeover in 2016, he has tried to get some of Belgium’s newer breweries interested, and has produced materials for, among others, Wieze beer and Petre Devos – two extinct beers that are being brought back to life, like Emaillerie Belge, by Flemish entrepreneurs. The beer panels make up around 60-70% of the factory’s output, alongside new forays into art, design, and architecture. Even if the company now makes tables, sinks, closets, and metro signs, beer has been the common thread throughout Emaillerie Belge’s history, as evidenced by the wall of ad panels, and a batch of Orval adverts fresh out of the furnace have been set aside, bubble wrapped and ready to be shipped to the monastery. 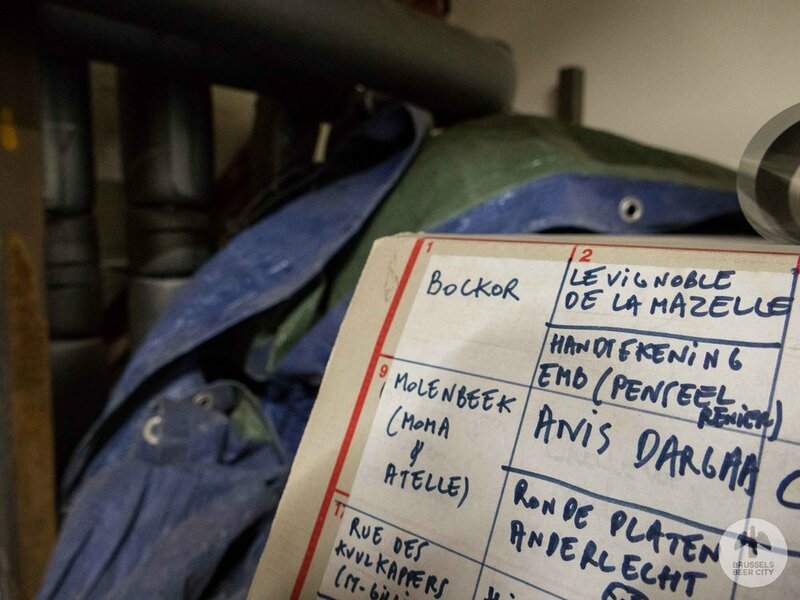 Upstairs, a low-ceilinged room tucked in under the roof, is full of greying moving boxes are piled high, with words like “Zundert”, “La Rulles” and “Bockor” scrawled on them in thick blue marker. This is the emaillerie’s archive, and the boxes contain master screen print copies of every panel the factory has made since it opened in 1921. Production started in Molenbeek when it was still Belgium’s Petit Manchester. The trajectory of the enamel industry in Brussels mirrored its brewery clients. Both explosive interwar boom followed by a post-war Indian summer, which slouched into a slow, grinding, inevitable decline marked by abortive attempts to abandon their core product. Eventually, like its brewing equivalent Brasserie Cantillon, Emaillerie Belge was left as the only enamel factory left in Brussels. In the good times, the emaillerie’s customers were drinks companies – not just beer, but coca cola and coffee – as well as commissions for road signs and businesses. “The 1940s and 1950s were the boom times for Emaillerie Belge,” says Vanden Borre; at its height Brussels had nine enamel factories, with Emaillerie Belge employed 138 people. Bans on public advertising in the late 1950s crippled the industry and Emaillerie Belge refocused their activities on commercially lucrative and cheaper materials – aluminium, PVC, and neon. Having cycled through several owners by the 1990s, the company had returned to its core enamel work and experienced a bump in sales due to the growing popularity of enamel comic strip panels. But rot eventually set in. Despite a new bump in sales thanks to a growing market for enamel comic strip signs, Emaillerie Belge’s final owner before Vanden Borre’s takeover was running down the business in the expectation that he would either sell it or just shut it down when he finally retired. “Emaillerie Belge was going to stop its activity in September 2016. They would close the books, it was finished, the building was already sold,” he says. The move to a new building and the push into new markets aside, Vanden Borre was keen to accommodate the old Emaillerie Belge in his iteration of the company. While the furnace is brand new, they still print the enamel designs on the same battered electric blue screen printer. 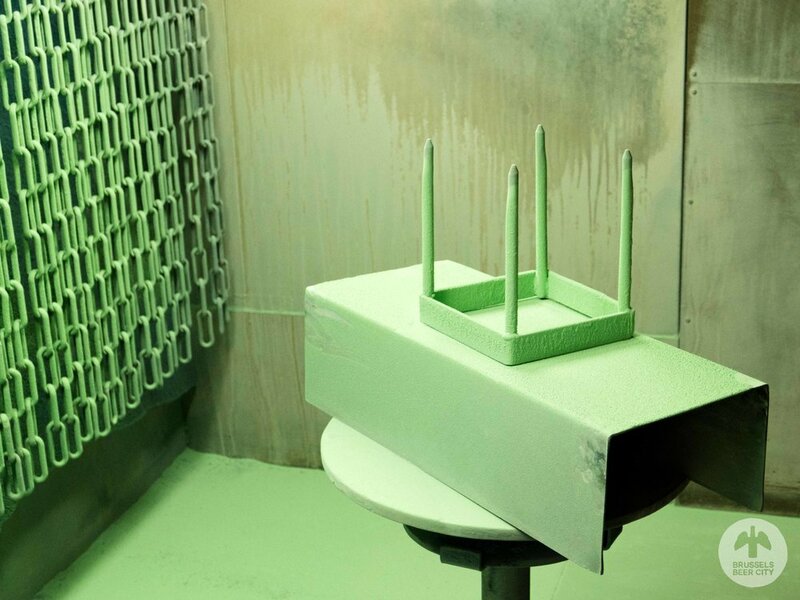 It has been put in one of the factory’s side rooms, alongside display panels showing the various enamelling stages – first a metal base layer, then a green layer, a blue layer, a white layer, and so on until it coalesces into a distinct image. Vanden Borre also kept on the five employees who were left at the old factory because, he says, working with enamel is a technically precise job, one you can only learn by working directly with the materials, and people with that kind of experience are hard to find. Many of the old, and new, employees are Brussels locals, and this was an important factor in Vanden Borre keeping the company in Brussels when he took over, when it would have been easier and cheaper to find a new location outside the city boundaries. Emaillerie Belge, a small-scale, relatively light industry that employs skilled manual work in a part of Brussels that’s struggled with chronic unemployment since a previous generation of industry abandoned the city, fits right into Borret’s plans. His activism was enough to support the creation of a new brewing hub at the Tour & taxis site. And it convinced Emaillerie Belge to stay in Brussels. Existential questions dealt with, Vanden Borre’s challenge now is making sure Emaillerie Belge can compete with commodity enamel producers from central and eastern Europe. They can afford to undercut his prices, even if the perceived quality of the end product is lower. Vanden Borre hopes that a commitment to what he sees as their superior production skills and niche brand will see them through. “Our name…Emaillerie Belge is directly linked with quality, service, and finishing,” he says. To demonstrate this, Vanden Borre opens a door to a side-room that reeks of Airfix model glue and is stacked with a kaleidoscope of coloured glass jars. It’s where they mix and blend enamel finishes and colours to match their clients’ demands. 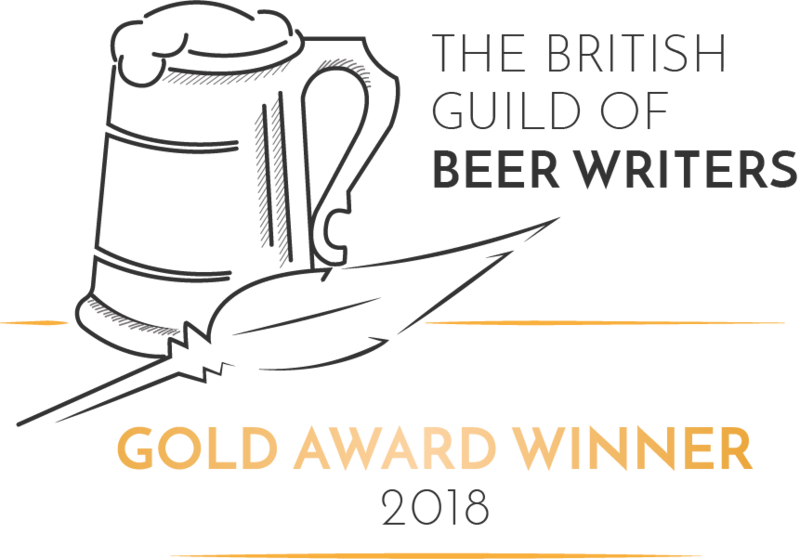 This means that, unlike their cheaper rivals who use colour mixes bought in, they can conjure up specific colours for each of their designs, be it the deep blue of Chimay, the royal purple of La Trappe, or the muddy river green of an Orval trout. Alongside the custom colours, Emaillerie Belge only produces beer adverts to order; their central European rivals are, according to Vanden Borre, far less reticent about putting out unofficial replicas. So next time you are in your local Belgian-inspired bar, have a look on the walls around you to see what beer ads are hanging there. “If it’s a new production, an official production, there’s a 90% chance it comes from here,” says Vanden Borre. Just to be sure, and especially if it is an older model, you can check the bottom corner of the panel. If you can read the words “L’Emaillerie Belge Bruxelles” then you can be certain that it was pressed and printed by Brussels hands.